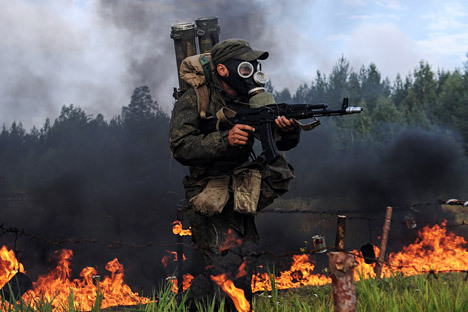 A member of Russia’s Central Military District RChBD defence runs through a fire in a RChBD suit during annual military drills. RChBD unit personnel to take part in the Russian-Mongolian Selenga-2016 exercise and the Russian-Indian Indra-2016 exercise. Russia's Eastern Military District (EMD) Radiation, Chemical, and Biological Defence Troops (RChBD) are due to take part in two joint international military exercises with India and Mongolia in 2016, the EMD's press service said Saturday. "The new year for the RChBD will be full of combat training events, which include RChBD unit personnel taking part in two international exercises: the Russian-Mongolian Selenga-2016 exercise and the Russian-Indian Indra-2016 exercise, as well as tens of special tactical exercises, hundreds of training and practical events on the district's polygons," the EMD press release said. In 2015, RChBD personnel took part in 100 training events, the release added, mentioning the interdepartmental exercise in the Primorsky region involving liquidation of an emergency at a hazardous radioactive installation. The Selega-2016 will be the ninth joint exercise between Mongolia and Russia since 2008. The two countries' troops will engage in a simulated counter-terrorist operation and practice detecting, blocking and eliminating simulated illegal armed groups, according the Russia's defense ministry. The Indra exercises are a long-term training program held by Russia and India from 2011 until 2020.